This was send to me my Martin.I was touched by this and wanted to share it with you.Heartwarming etc. Courtesy of David Webster David Webster, left, and Larry Kramer. 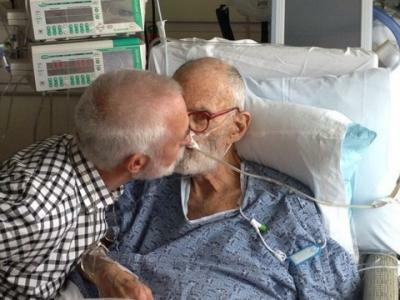 Larry Kramer, the award-winning playwright of “The Normal Heart” and longtime gay rights advocate, married his partner, David Webster, on Wednesday in the intensive care unit of NYU Langone Medical Center, where Mr. Kramer has been recovering from surgery for a bowel obstruction. Mr. Webster, in a telephone interview on Thursday, said the couple had set the wedding date a few weeks earlier, before Mr. Kramer’s health flare-up. The original plan – to be married on the terrace of their Greenwich Village apartment with two witnesses and the officiant, Judge Eve Preminger – was scrapped in favor of the intensive care unit, where two dozen friends and relatives attended the noontime ceremony led by Judge Preminger. The two men exchanged Cartier rings they had purchased last week, Mr. Webster said. Instead of vows, they spoke from the heart. “Why would Larry need a script?” Mr. Webster said, laughing. Mr. Kramer was resting on Thursday morning and not available for an interview. One of the first prominent advocates in the early 1980s for government action against H.I.V. and AIDS, Mr. Kramer went on to help found the Gay Men’s Health Crisis and Act Up and to write acclaimed plays about gay men and AIDS, most notably “The Normal Heart,” which won the Tony Award for best play revival on Broadway in 2011. Mr. Kramer received a special Tony in June for humanitarian service. Mr. Kramer had held a skeptical view of state laws permitting gay marriage as long as the federal Defense of Marriage Act was in place; in 2011 he referred to such unions as “feel-good marriages” because they conveyed few tangible benefits, since the federal law restricted hundreds of government benefits to heterosexual marriages. But after the Supreme Court, in a 5-to-4 ruling, struck down the Defense of Marriage Act last month, Mr. Kramer decided it was time to marry, Mr. Webster said. Mr. Kramer, 78, and Mr. Webster, an architect who is 67, dated in the 1970s and have been partners since the mid-1990s. Mr. Kramer based central characters in his 1978 novel “Faggots” on himself and Mr. Webster. Mr. Webster said that Mr. Kramer checked himself into the hospital on Friday and had bypass surgery early Sunday morning. Mr. Kramer is feeling better, Mr. Webster added, and hopes to move to a private room soon. Trust he will recover completely. It's very draining to have surgery in later life. Lovely that they could marry in the ICU. Is that NYC for you, or what?